Throughout her childhood, eight-year-old Esther has had just one, very simple, wish. She has longed to go to school. Sadly though, being born with a disability has meant that this wish has been nothing short of a pipedream. 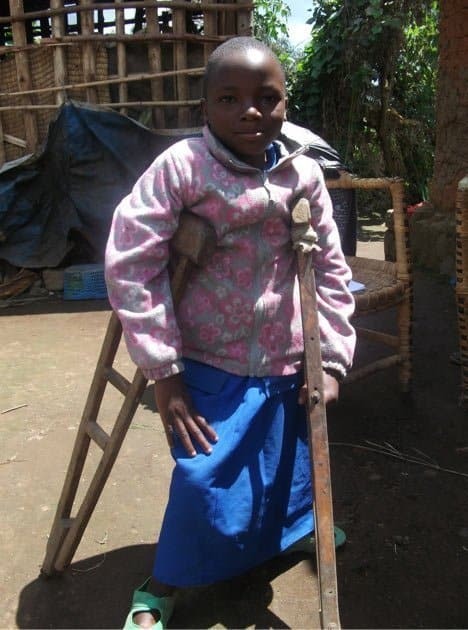 Esther is unable to walk unaided and can’t venture even small distances. Travelling to her nearest school in Rwanda has been an impossibility which has forced her to spend most of her young life at home, alone. There is a good reason why Esther is so desperate to get an education. She knows that it’s only by studying that she’ll have any chance of finding work in the future and escaping the desperate poverty her family now face. So seeing her siblings heading to school has been like torture. Thankfully though, Esther’s prayers have been answered. She’s been given a wheelchair which means her sister can push her to school. And a project funded by generous Chance for Childhood donors like you is funding a Learning Support Assistant who is helping Esther to catch up on her studies and reach her full potential. By going to school, Esther now has the chance in life which she deserves. And her wish has finally come true.